Hey y'all. I have no weights or recipes or updates to share. 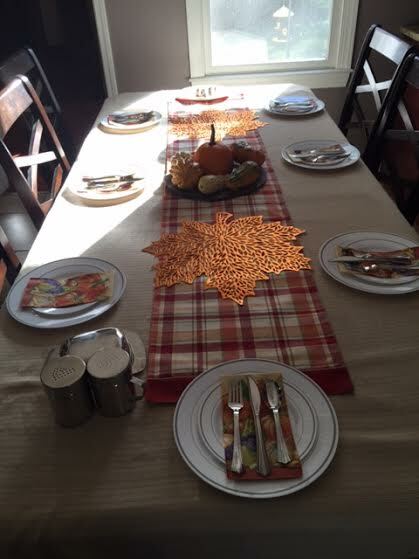 I will just share a picture of my Mom's Thanksgiving table and a picture of the stadium because Bama beat Auburn and they are headed to the SEC Championship this weekend. I have nothing to share because it's the last couple weeks of school, I'm trying to pack and get ready to move and oh, I have been in a shame spiral since Thanksgiving day. I didn't want to look on the scale. I'm disappointed with myself but worked out and sticking to the diet today. One day at a time I guess, especially during the holidays. I'll do my best to keep you in the loop and cook something in the next week or two but I'm not making any promises. The new year will hold better blogs. Hey y'all. First, let me go ahead and say Happy Thanksgiving to all of you! I hope you get some time to rest and enjoy your families and friends. I was up almost half a pound when I weighed Saturday which sadly made me happy since I ate too much last weekend. I doubt I'll be so lucky when I weigh at the end of this week considering Thanksgiving and all. I have been pretty hard on myself mentally about the food I've been eating on the weekends but haven't been motivated to change. I am going to do my best to struggle through the holidays without gaining too much but it's always a challenge. 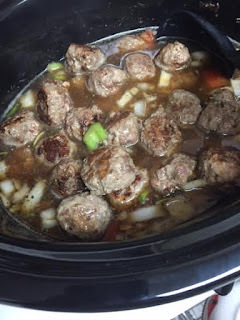 Once again, I took to the crockpot for a recipe. This time it was Bolognese sauce and I think it has been my favorite so far. The good thing was that I could easily serve mine with zucchini noodles and whip up "real" noodles for Ian. The other great thing was that it wasn't all that expensive and I was able to serve four people and had a ton of leftovers to last through the week. 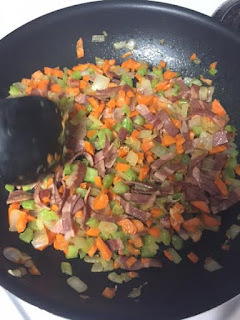 All I did was sauté some veggies (I believe it's called the trinity with onion, celery and carrots) with turkey bacon (you could also use pancetta), add lean ground beef (that you drain), crushed tomatoes (that you add to the top of the meat mixture in the crockpot), spices etc and pop it in the crockpot. 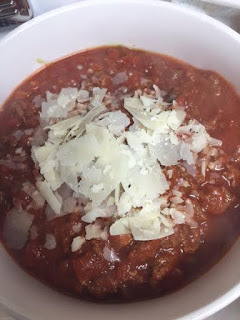 6 hours later, you have rich, flavorful bolognese. It was so easy and quite delicious. Ian liked it and he didn't seem bothered at all by the veggies. Happy Monday everyone! We are inching closer and closer to the holidays which means it's going to be more and more difficult to "be good." As for me, as much as I love football, this season has been way harder than any holiday challenges I've had in the past. I had a perfect week until Friday. I weighed Friday morning and I was up over 2 pounds. Even though I had eaten perfectly for 11 and a half straight days (but who's counting) I was up. I kind of expected it though because the week before I had some type of stomach virus or something that caused me to lose weight. I figured it would balance out. I had an unexpected trip to Nashville on Friday though and I won't even talk about my behavior Friday, Saturday and Sunday. It was a hot mess. I am back in business today and decided not to dwell on it because it never does any good. I am someone who ALWAYS eats breakfast. I'm usually hungry as soon as I wake up so I rarely skip it. I love an Egg White Delight from McDonald's. Usually though I don't have time to stop and get one. Well, I found a cheaper, better tasting, quick solution. I have to give Pinterest credit for this one. 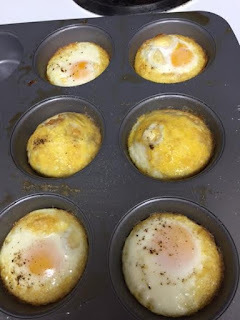 All you do is take a muffin tin and spray it with non-stick spray. The oven should be pre-heated to 350. 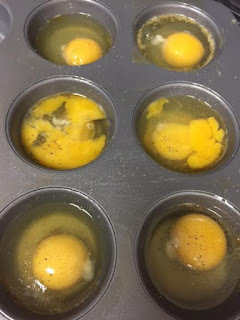 Crack an egg in each cup, pop it in the oven and about 15 minutes later, you get a round egg, ready for an English muffin. I also added some salt and pepper before they went in. 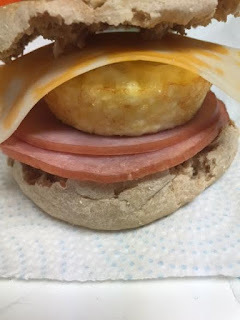 I put them in a plastic container and saved them all week so I could throw together an egg, Canadian bacon and cheese breakfast sandwich on a light Enligh muffin. It couldn't be easier. It was also more filling than the McDonald's version, better tasting and of course cheaper. I highly recommend it! 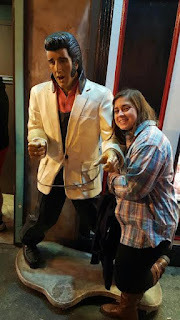 As I mentioned, I went to Nashville Friday night with my brother and a couple of his friends. My Dad was supposed to go but was sick and in the hospital last week. He's OK now but gave us a bit of a scare so he needed to rest. I hate the circumstances that allowed me to go but I am glad I was able to because I had a great time with my brother. 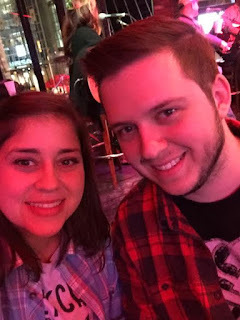 We rarely get to hang out like that and the fact that it was Nashville made it even better. 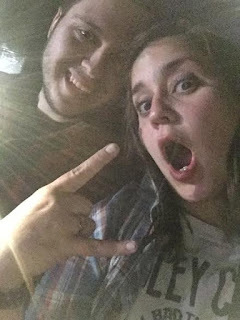 It is also such a blessing to know we went to the concert without fear of terrorist attack. I hope and pray for anyone around the world who has to live in fear. We have one more home game in T-Town and then it's Iron Bowl time. Hey y'all! Roll Tide! Also, shout out to ALL vets out there! Happy Early Veterans Day. Thank you as always for your service. I had a fantastic weekend. Alabama dominated and I just had a fun, relaxing weekend all around. 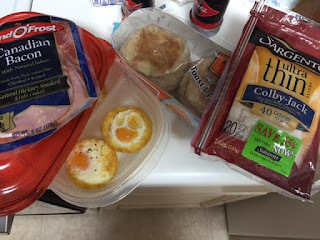 I am pleased to admit I had my first perfect dieting week in awhile. I even took sandwiches to tailgate so I had a small sandwich before and after the game. It allowed some wiggle room in the drink/snack department but I never went over. It felt amazing to do the right thing. It also showed on the scale. Sadly the number I got when I weighed Saturday is probably skewed because I either had a touch of a stomach virus this week or I got a little bit of food poisoning from something I ate (possibly the soup I'm about to show you...but YOLO, right?) I was down almost 5 pounds which is a lot so if I go up this week, I'll know it's because I'm balancing out from being sick to my stomach for 4 or 5 days in a row and not because I did something wrong. Here's hoping I carry the "being good" trend into this week. I'd like to get down a few more before Thanksgiving. The important thing is, I felt kinda pretty on Saturday for the first time in weeks and I could definitely use more of that feeling. 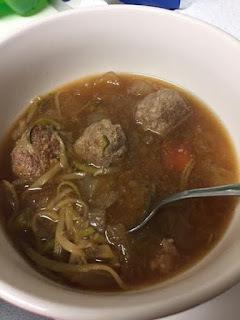 This past week I made Italian Meatball Zoodle Soup. 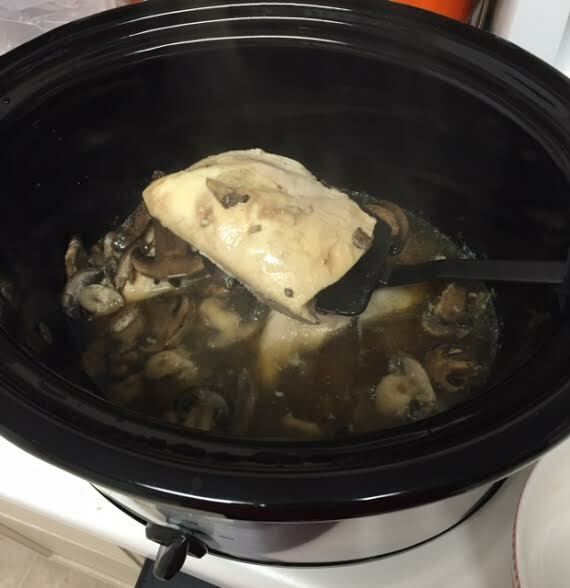 This was another crock pot recipe. 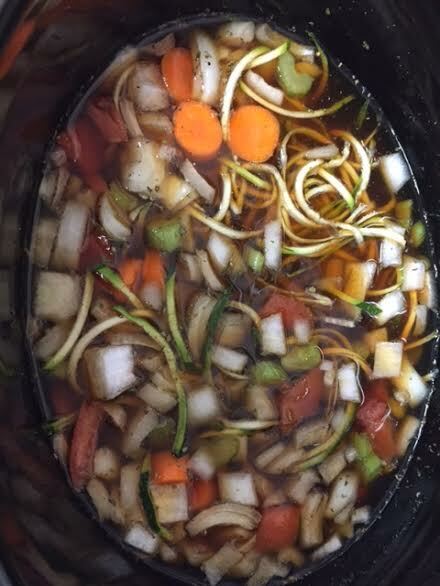 The base of the soup is pretty much beef stock and veggies. 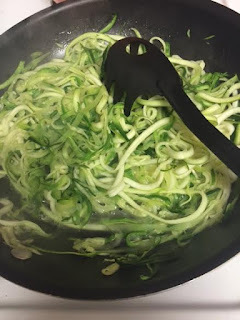 It included zucchini (in which I made into "zoodles"), celery, onion, carrot and tomato. You pile all of the veggies in with 32 ounces of beef stock (add some garlic salt) and turn the crock pot onto low then cover it. 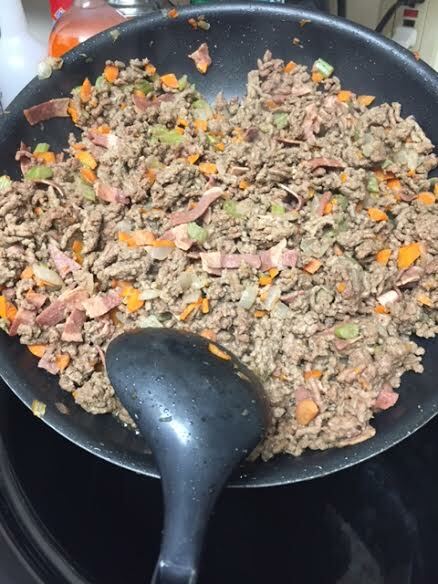 After that's done, get a bowl out, mix together 1-1/2 pounds of lean ground meat with six cloves of garlic, 1/2 cup parmesan cheese, 1 egg, parsley, sea salt, onion powder, Italian seasoning, oregano and black pepper. 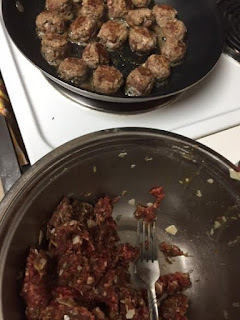 Heat a skillet on low to medium that you've sprayed with non-stick spray, turn the beef mixture into small meatballs and heat them in the skillet for a few minutes, browning them on the outside. Drain the fat. 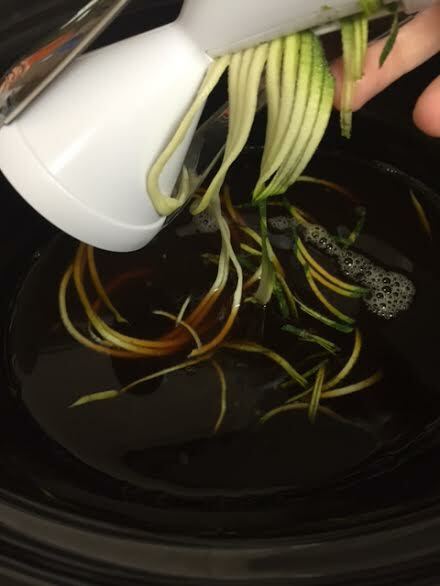 They don't have to be cooked all the way because once you've done that, toss them in the crockpot and let that thing go for 5-1/2-6 hours. So, I'm one of those people that operates MUCH better with a recipe. 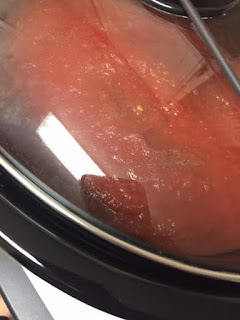 In this recipe, it didn't tell me to drain the fat from the meatballs...so I didn't. I did consider it because my instinct told me to do so but it wasn't in the recipe so I left it out. Even though I used very lean meat, I think the grease in the soup is what made me sick. I also ate it several times in a row. Ian had one bowl but I think that was only because he wanted to make me happy. There were 12 servings in the pot and for one person, it's just too much. I detest wasting food so I kept trying to eat it and eat it which kept the ball rolling on the sick stomach thing. It tasted delicious. My only complaint was that I think the broth was a little too salty. Coming from me that says a lot because I'm a salt person but if I made it again, I'd get low sodium broth. I ended up chunking the rest of it away yesterday which made me feel horrible because I feel like I'm throwing away money but it looked gross. The fat had separated so I got rid of it. I didn't want to be sick anymore. What's funny about me is that thrown away food will haunt me for awhile. So, if you decide to make it (it's good, I promise), drain fat from the meatballs and use low sodium broth. You can use whatever veggies you want. I have to give Ian a shout out this week. He looks at my Pinterest boards sometimes for ideas and ways to surprise me. He saw something I had pinned, collaborated with his mom, she made it and he went to pick it up yesterday. 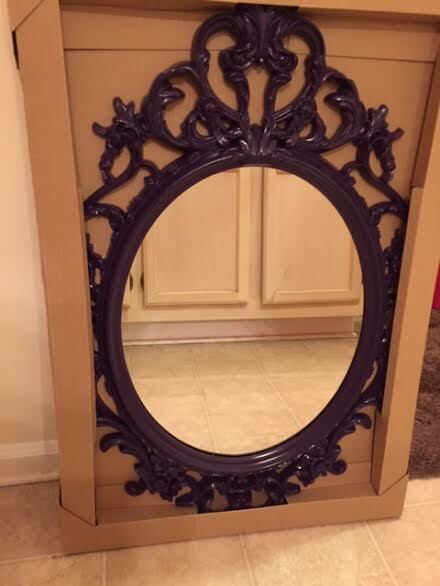 It was this gorgeous, purple mirror. I didn't even do anything to deserve a present, haha but I guess those are the best kind. Alabama is playing away this weekend so I'm going to stay away from all tempting tailgate fare. Here's to them beating Mississippi State! Hey y'all. Sorry for the late post. It's Monday, Fall Break is over and I'm so busy I don't know where to start. 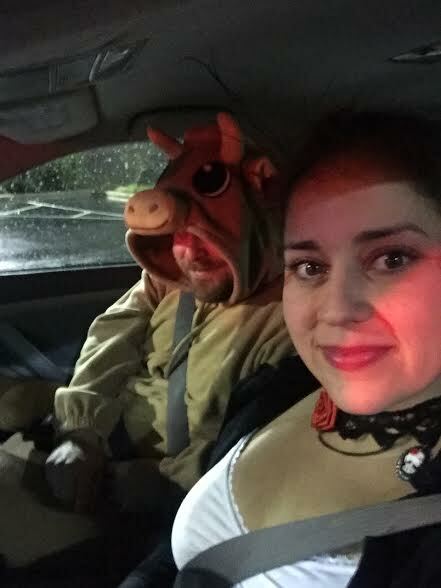 So, I'll keep it simple, I didn't weigh, back on today, Halloween was fun, dieting is not fun and Roll Tide because Bame plays LSU this weekend. 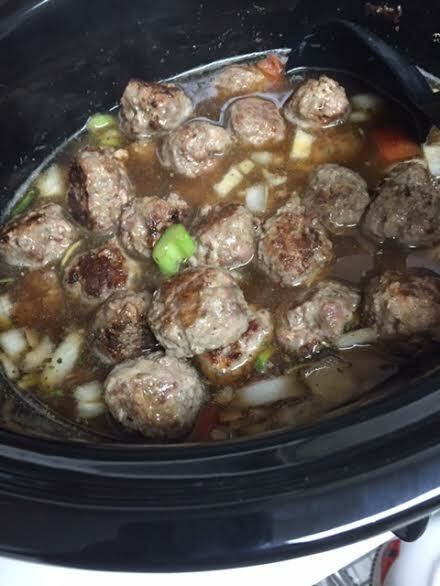 I'm in a crock pot mode right now so don't be surprised if you see multiple crock recipes in the future. I love how easy it is to toss everything in one pot, let it go then come back to tender, flavorful meat and a full dinner. 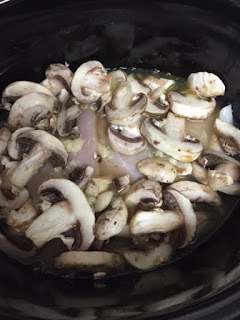 This is crock pot chicken marsala. 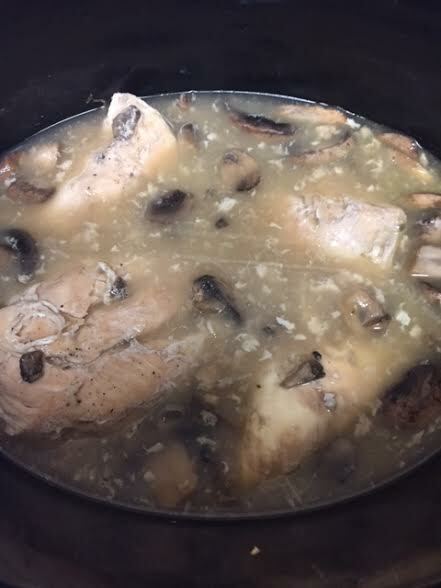 I opted to use chicken stock instead of white wine because it's cheaper and lower in calories. I'm happy with the decision. 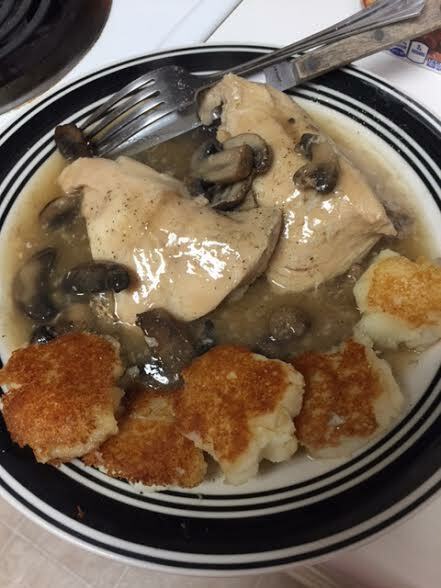 One chicken breast with the mushroom sauce is 225 calories. I had enough calories to have two pieces of chicken with sauce and these little potato cakes I whip up in no time. The recipe is simple, put chicken in the bottom of the crock pot, add the broth, mushrooms and garlic. 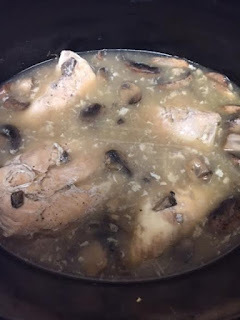 Once it's been in on low about 5 hours, remove the chicken, stir up some corn starch and water, add that to the sauce and then replace the chicken. Let it go on high for about another 20-30 minutes and you're done. I hope to be less busy next week but I doubt it!